Jaguar has been teasing since pretty while with the Jaguar XE details. The same created more curiosity with the rounds of rumors revolving all around the automotive industry. 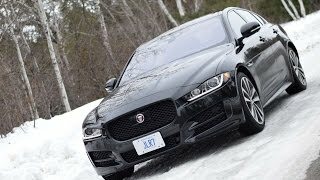 Finally the wait is over and the marvelous Jaguar XE AWD 2017 is out. Jaguar has given some stunning exterior touched and refined luxurious interior to this new release. 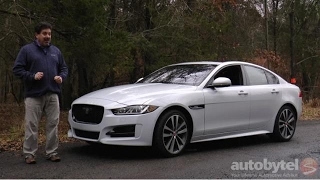 Let us have a look at the specifications and performance details of Jaguar XE AWD 2017 through its review. The interior of Jaguar XE AWD 2017 is clean and luxurious enough to beat the competitors. The sporty interior come dipped in aluminum, traditional wood veneers and piano-black inserts and finisnhing. The cabin is more of driver focused with center console separating front seats. However the major integration taking the gleam is the all new infotainment system. The integration comes with InControl Touch and InControl Touch Pro. The former includes an eight-inch touchscreen with Bluetooth, audio streaming, voice control and navigation while the later take a lap ahead and offers quad-core processor, performing lighting fast. The same further is connected to Ethernet networking cable. The company claims the Touch Pro is five times faster than the one offered by competing models. 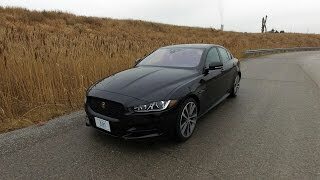 In all rounding up the interior details of Jaguar XE AWD 2017 all I would say is, company has shown the dedication and love while creating this piece of work. 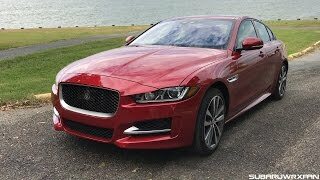 The exterior of Jaguar XE AWD 2017 is n impeccable amalgamation of everything that a sports sedan should carry. Starting with the front fascia you’ll be noticing the massive grille amidst the narrow headlamps that are highlighted. Beneath the set up are aggressive air dams housed over almost the entire bumper. Moving towards the rear end we have 17-inch wheels rolling the model. However the same come with the standard model and with the higher trims they turn to be 18- to 20- inch rollers. The rear end carries minute clues from the XF. The major hints of same can be noticed over the bumper areas and taillights. In all the exterior details of Jaguar XE AWD 2017 has everything to complement its interior and performance figures of the model. Beneath the hood of Jaguar XE AWD 2017 will be five engine options mounted in five trims. The lineup includes two 2.0 liter four-cylinder diesel engines generating total output of 160 hp and 177 hp and peak torque of 380 nm and 430 nm respectively. Both the diesel engine can sprint from 0-60 mph in 7.7 seconds (7.9 seconds: manual) and 7.4 seconds respectively while the top speed mark touches the figure of 141 mph and 142 mph respectively. Talking about the petrol lineup, it has three options; two 2.0 liter four-cylinder petrol engines and one 3.0 liter V6 generating total output of 197 hp 237 hp and 335 hp and peak torque of 280 nm, 340 nm and 450 nm respectively. 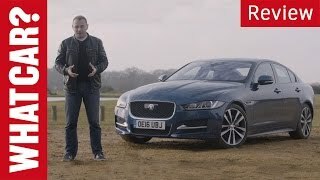 The 0-60 mph sprint with these can be knocked in 7.1 seconds, 6.5 seconds and 4.9 seconds respectively while the top speed of Jaguar XE AWD 2017 diesel engines touches the mark of 147 mph, 155 mph and 155 mph respectively.